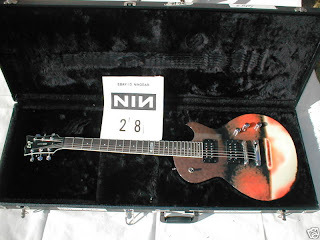 The Guitar Column: Nine Inch Nails Selling Tour Gear On eBay! After playing their last show at the Wiltern Theater in Los Angeles on 10th September, Nine Inch Nails have decided to auction their touring gear on eBay. "We've been going through the NIN touring and studio rigs and are getting rid of a large selection of gear and equipment the band is no longer in need of. It's being listed on eBay here. We do not know which (if any) tour these items are from unless specified, nor can we get any items autographed, so please do not ask. Hundreds of items will be listed over the next several weeks such as guitars, keyboards, amplifiers, drums, staging, anvil cases, cables, rack/outboard gear, guitar effects, and pedal boards. Check the eBay page regularly for new listings, or follow @nineinchnails on Twitter for updates. More information can be found in the descriptions of each item." Some items listed are near mint and some are 'tour casualties' -- broken necks and all. 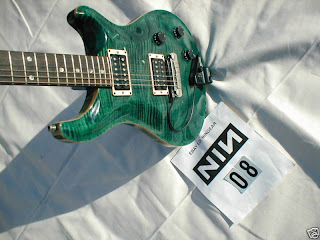 Pictured is a near mint one-off custom shop ESP USA with The Fragile album graphic and Trent Reznor's Roland GK midi-pickup equipped green PRS Custom 22 tour guitar!